Get Your Spring Gypsy Savings May 1 – 15, 2017. Buy 1 Gypsy Horse & Get a 2nd Gypsy Horse at 50% off their listed Sale Price! View our Gypsy Horses Available for Sale. 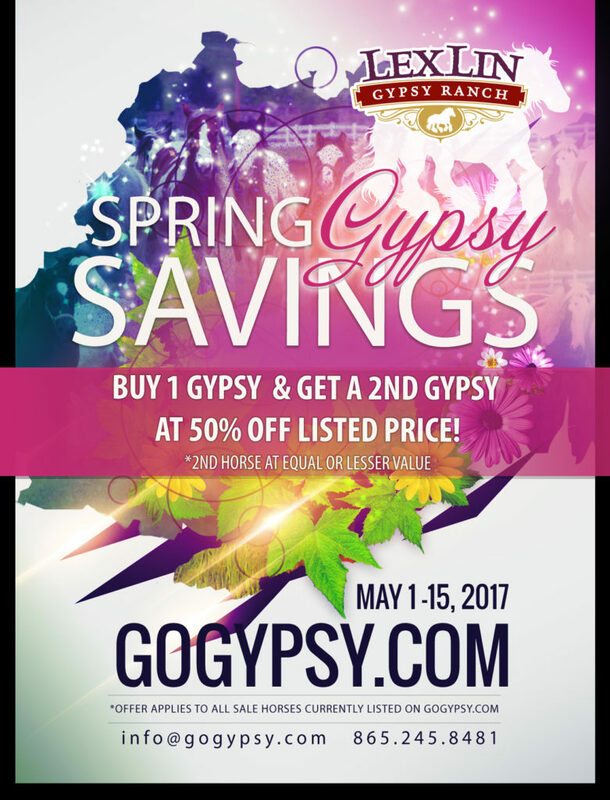 *2nd Gypsy Horse at equal or lesser value than the 1st Gypsy Horse purchased during May 1-15, 2017. Purchase a horse with financing up to 4 years in length with a minimum of 10% down payment. You’re welcome to take a horse home while under contract. Questions? Call 865.245.8481 or e-mail us via info@gogypsy.com. Contact us today via info@gogypsy.com or call 865.245.8481 to get your dream horse!